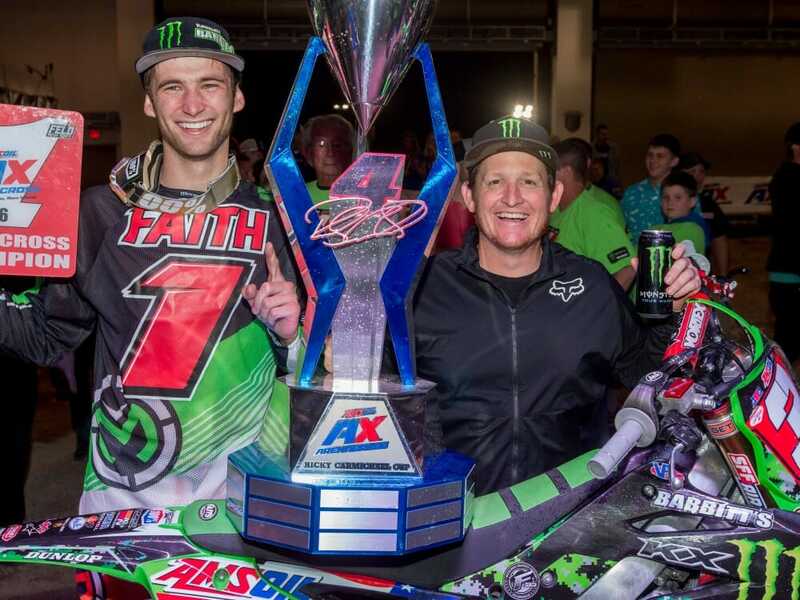 The Race to the Championship came to a dramatic conclusion on Friday night inside Orleans Arena as the three-rider Team Babbitt’s/Monster Energy/AMSOIL Kawasaki lineup of Gavin Faith, Chris Blose and Jacob Hayes battled to be the first recipient of the Ricky Carmichael Cup. The AMSOIL Arenacross Finals featured a packed house, with the crowd cheering on as Blose went on to sweep both of the Arenacross-class Main events. However, his flawless performance wasn’t enough to overcome the eight-point deficit to Faith, who followed his teammate across the line in second in each Main event to clinch his first career title. In the Arenacross Lites-class East/West Shootout, Strikt/Triple-Effect/Us Racing Yamaha’s Ryan Breece took the win as TZR/Woodstock KTM’s Cody VanBuskirk walked away with the Western Regional Arenacross Lites Championship. Blose began his path to victory in Las Vegas by emerging victorious in the RMATV/MC Head 2 Head Challenge, which awarded him an additional championship bonus point and a seven-point deficit entering the Main Events. He kept the ball rolling into the first Arenacross Class Main Event by grabbing the holeshot ahead of Hayes and TiLUBE/TUF Racing Honda’s Jace Owen. TZR/Woodstock KTM’s Travis Sewell was fourth, with Faith in fifth. Faith was able to quickly position himself into fourth and then seized an opportunity to jump into second by blitzing alongside Hayes and Owen in the whoops as they battled for position. That put Faith into an ideal position to follow his teammate out front, while Owen secured third over Hayes. Blose and Faith settled into their spots out front, setting consistent laps and establishing a comfortable margin over the field. After several laps of pressure Hayes was able to make the pass on Owen for third on lap nine. He attempted to make a push to catch his teammates, but couldn’t get close enough to mount a challenge. Blose went wire-to-wire and took the checkered flag a couple of seconds ahead of Faith, with Hayes following in third. Sewell made a late pass on Owen to secure fourth, with Owen rounding out the top five. Following his runner-up effort in the first Main event, Faith needed to finish seventh or better in the final Main Event of the 2016 season in order to secure the title. Defending AMSOIL Arenacross Champion Kyle Regal put his Rockstar Energy Drink Husqvarna Factory Racing presented by FMC and OTSFF machine into the lead to start the second Main Event, with Blose right on his rear fender. Sewell was third, with Faith slotting into fourth. Blose wasted little time in passing Regal and took control of the race on the opening lap. Shortly thereafter Sewell and Regal made contact with one another while battling for second, which allowed Faith to move into third as Regal slipped away to maintain control of second. Faith patiently waited for his opportunity to make a clean pass on Regal and made the pass for second on Lap 4. A couple laps later Regal slowed and lost several positions, handing third to Sewell. 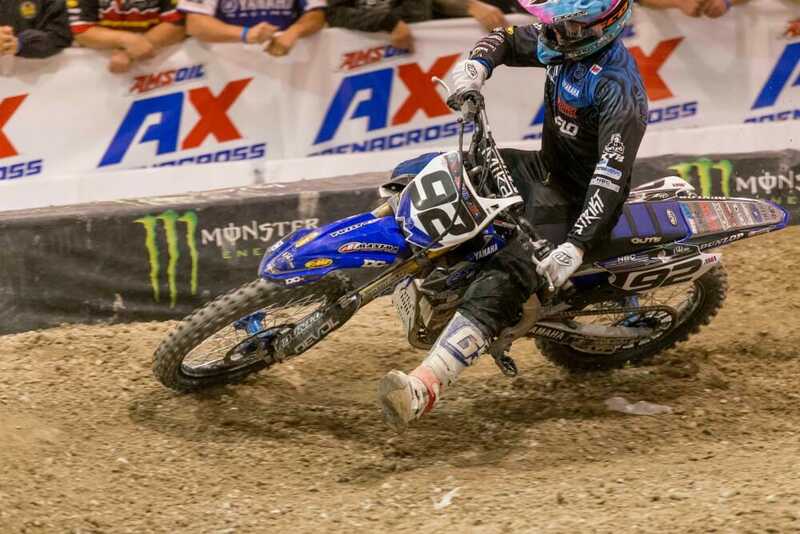 With Blose and Faith out front, the second Main event became a mirror image of the first as the pair logged consistent laps and navigated through lapped riders. After starting seventh, Hayes was on a torrid charge to the front and progressively picked off riders, ultimately positioning himself in fourth right behind Sewell. On lap nine Hayes was able to make the pass for the final spot on the podium in the whoops and once again did all he could to close the gap to his teammates in the closing laps. Faith closed in on Blose on the final lap, but didn’t need to force the issue knowing the championship would be his with another runner-up finish. Blose capped off a near-perfect night by taking the checkered flag just over a second ahead of Faith, with Hayes right behind them in third. Sewell was fourth with Owen in fifth for an identical top five from the first Main event. Blose (1-1) led every lap of both Arenacross-class Main events and took the Head 2 Head Challenge win to maximize his point total for the evening, but Faith’s consistency (2-2) was too much to overcome. In the end Hayes’ 3-3 finishes behind his teammates meant the Team Babbitt’s/Monster Energy/AMSOIL Kawasaki trio swept the overall podium for the fourth time this season and secured a 1-2-3 finish in the final championship standings by doing so. Sewell was fourth overall (4-4), with Owen completing the top five (5-5). The championship is the first of Faith’s career, one season after finishing third in the final standings. He ended the season just five points ahead of Blose and became the first rider to hoist the Ricky Carmichael Cup. JMC Motorsports/K1 Speed Husqvarna’s Chris Howell grabbed the holeshot to start the Arenacross Lites-class East/West Shootout but crashed out of the race in the first rhythm section, resulting in a red flag and a restart. When the field roared out of the gate for the restart it was Blue Buffalo/Slater Skins Yamaha’s Josh Cartwright who captured the holeshot ahead of Breece and Rockstar Energy Drink Husqvarna Factory Racing’s Kyle Bitterman. VanBuskirk slotted into fourth, just ahead of Scott Sports/Knor Motorsports Husqvarna’s Dave Ginolfi. Breece was able to take over the lead from Cartwright and proceeded to establish an early gap. Cartwright settled into second with Bitterman in tow. A hard-charging Daniel Herrlein, the 2016 Eastern Regional Arenacross Lites Class Champion, began to move his way forward aboard his A&Y Racing Honda, moving past Ginolfi and then VanBuskirk to take over fourth. VanBuskirk would lose a couple more positions before making a climb back to the front. While Breece continued to extend his lead out front, Herrlein continued to improve positions, passing Bitterman for third and then Cartwright for second on lap 10. Bitterman would then fall into the clutches of Cartwright and lose control of third. Breece earned his second consecutive Arenacross Lites Class East/West Shootout victory, crossing the line 12 seconds ahead of Herrlein, with Cartwright in third. Bitterman followed in fourth, while VanBuskirk battled back to finish fifth. VanBuskirk entered Las Vegas with an eight-point advantage of Team DirtBike Mike/KTM Sports Center of Little Rock KTM’s Ben Nelko, but after Nelko failed to make the Main Event VanBuskirk clinched the title as soon as the gate dropped. It is the first career title for the Illinois rider. 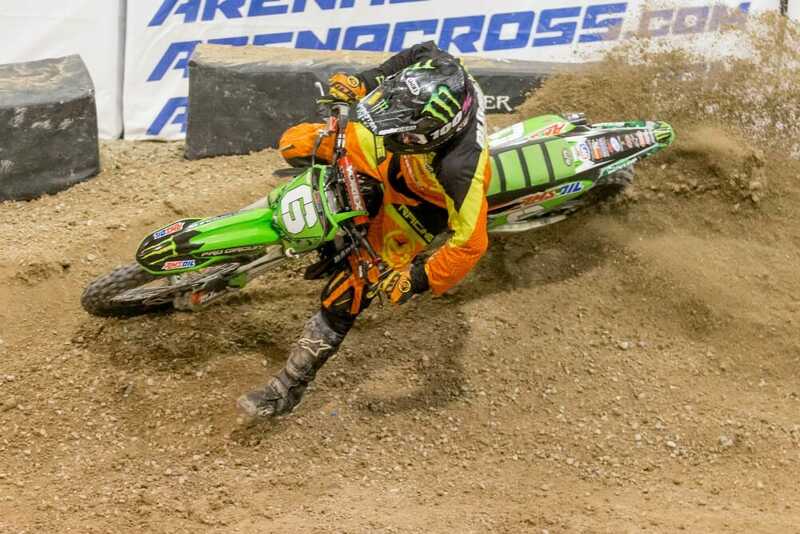 VanBuskirk completed the Western Regional Arenacross Lites Championship with a 20-point lead over Nelko. MX Athletics/Racetech KTM’s Carlen Gardner rounded out the final standings in third.